Have you heard? My favorite hair partner, Goody, is conducting a styling, modeling and blogging workshop plus fashion show audition in one!!! Come play with Goody, celebrity stylist Alyanna Martinez, model/media personality Divine Lee and I as we share with you our styling, modeling and blogging know-hows. We’ll tackle everything from image development to the latest fashion and beauty trends and so much more! Blowout Bar will also be there to teach you some hair styling techniques. Exciting right? After the workshop, you can also audition for Goody’s fashion show happening this September! Alyanna and I will be part of the panel of judges for this so it’s going to be loads of fun. This special event by Goody is happening on September 15 from 1-5pm at the SM Mall of Asia Atrium. To get a complimentary pass to this event and an exclusive invitation to audition for the fashion show, all you have to do is purchase a minimum amount of P350 worth of Goody products at selected SM Department Stores nationwide from August 15 to September 15. That’s not all Goody has cooked up for you! 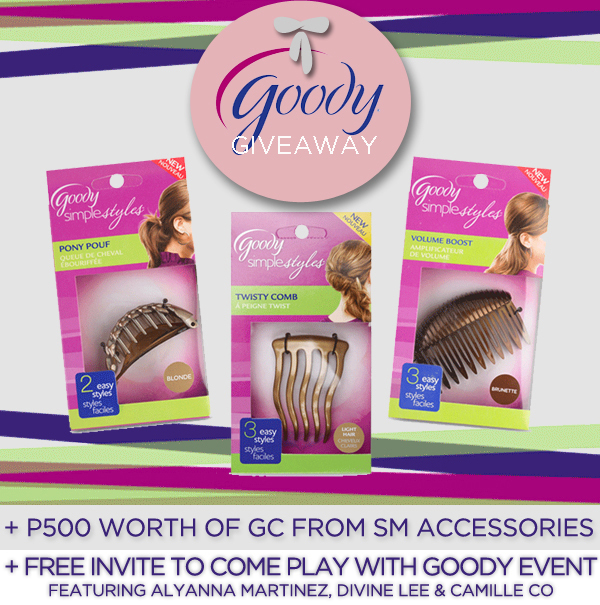 To celebrate this event, Goody is giving 5 of my lucky readers each of these hair tools from their Simple Styles collection namely, the Pony Pouf, Volume Booster and Twisty Comb PLUS a P500 worth of SM Accessories gift certificate PLUS A FREE INVITE TO THE EVENT! I know you’re probably already familiar with the Pony Pouf and Volume Booster. The Twisty Comb, on the other hand, not so much. It’s actually the latest addition to the Simple Styles Collection and was only released this month. The Twisty Comb allows you to easily achieve three chic variations of trendy but otherwise challenging twists: a side twist ponytail, an up-do twist, and a half-up twist, thanks to its uniquely contoured design. Watch the video below for a short tutorial on how to achieve the side twist ponytail using the Twisty Comb. Follow me on Twitter, Bloglovin’ and Fashiolista. If you don’t have these accounts, it’s easy to make one! LOVE my photo here by clicking on the red heart. Like Goody Philippines on Facebook, JOIN their event page and follow them on Twitter. Like SM Accessories on Facebook and follow them on Twitter. Optional: Follow @GoodyPH on Instagram. One of the five winners will surely be chosen from entries that have done this step. Leave a comment below with your name, Twitter name and Instagram name (optional). Thanks for this lovely giveaway! I hope to finally meet you in person! Can I just go there to watch/snap photos? That’s a shame, it is not in England so I can’t go :( hope you have fun though! Hello, I hope to win an invite to the Come Play with Goody Philippines. I want to go and bring also my 10-year old daughter.